The film premiered at Arclight Hollywood on December 7, 2016 and was released in the United States on January 20, 2017, by The Weinstein Company. It grossed $24 million worldwide and received generally positive reviews from critics, with praise for Keaton's performance. The Founder grossed $12.8 million in the United States and Canada and $11.3 million in other territories, for a worldwide total of $24.1 million. On review aggregator Rotten Tomatoes, the film has an approval rating of 82% based on 232 reviews, with a weighted average of 7/10. 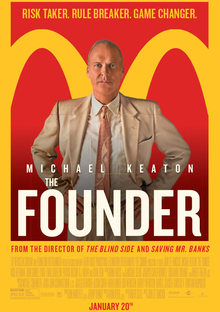 The website's critical consensus reads, "The Founder puts Michael Keaton's magnetic performance at the center of a smart, satisfying biopic that traces the rise of one of America's most influential businessmen – and the birth of one of its most far-reaching industries." On Metacritic, the film holds a weighted average score 66 out of 100, based on 47 critics, indicating "generally favorable reviews". Audiences polled by CinemaScore gave the film an average grade of "B+" on an A+ to F scale. ^ "The Founder (12A)". British Board of Film Classification. September 13, 2016. Retrieved September 14, 2016. ^ a b Tom Brueggemann (January 22, 2019). "Top Ten Box Office Takeaways: M. Night Shyamalan Returns with 'Split'". IndieWire. Retrieved April 1, 2019. ^ "The Founder (2017)". Rotten Tomatoes. Retrieved April 1, 2019.